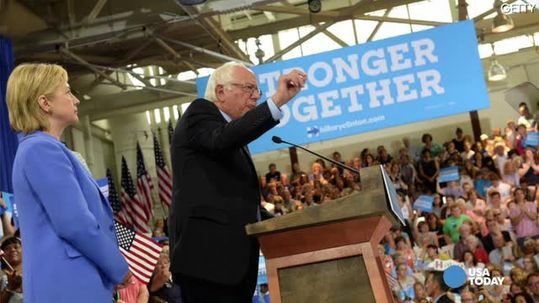 Bernie Sanders reportedly endorsed Hillary Clinton for president at a rally on Tuesday in New Hampshire. On the same day, new polls are showing Donald Trump, the Republican Party's presumptive nominee, as ahead of Clinton by 2 points. How can a non-politician, who had merely defeated all other contestants on the Republican Party's platform be leading an opponent already regarded by her supporters as the nation's president in waiting? How can she fall behind back in the polls, in spite of the jetting with President Barack Obama campaigning after the presidential endorsement? Observers are saying that the answer to these questions can be traced to recent negative news trends about the email server. Notably, Clinton was ahead of Trump in the polls from six points to four for about four weeks, but her lead had suddenly nosedived. She is gradually lagging behind enough that people are asking whether Sanders' endorsement of her on Tuesday is capable of renewing her lead in the polls. Observers doubt it. They say that if Obama's campaigning alongside Clinton has not given her the mojo to be far ahead in the polls, how can the endorsement of an opponent she has defeated in the party's primaries pull her from the brink. The brink being currently the situation that the Clinton campaign has found itself, following the much negative publicity that accompanied the airport show in Phoenix, and the simultaneous interview of Clinton of the FBI and her eventual clearance. Observers believe that the clearance of Clinton by the FBI had helped to call attention to the email server issue than quell it. The grilling of James Comey of the FBI added additional dimension to the email server saga, and members of the public who may have been ignorant of developments about Clinton and the email server imbroglio before then had the opportunity to see the nation's former first lady and secretary of state, in what seems the most difficult situation a candidate for the highest office in the land should not have been. The trouble is said as not completely over for Clinton concerning her testimony to the Congress and the truthfulness or otherwise of her words. Part of the new problem that came into light during Congress grilling of Comey. And Comey himself would have been on the hot seat he found himself during his grilling by the Congress over his clearance of Clinton, if there was no meeting at the Phoenix Airport by Bill Clinton and Lynch. A job that would have been easily to disposed off was thus made tougher for Comey. The one major gain from the drama was the act of transparency, which Comey momentarily hooked to justify his grilling anytime partisan members of the Democratic Party tried to ridicule his grilling and paint the grilling as partisan and that no such grilling of the FBI had happened before that day. Aside from the investigation into the email server, the combative nature of Sanders during the campaign and most of his debate with Clinton have helped to dent Clinton's run for the office of the president. It is now left to be seen if his endorsement can repair the damage. The campaign has moved from "Fighting for Us" to "Stronger Together" as sort of saying without all these support from these other politicians, the voters' support may not be sufficient for the Eureka.